Published quarterly and availale through Apple iTunes and Google Play. A former VP of Citibank, Philip Wollen OAM, challenges leaders to examine external costs currently not considered in their balance sheets. There are three categories business executives tend to fall into regarding ethical conduct: the first where ethical conduct is fundamental to what an executive does; the second where ethical issues are only addressed when an individual is made aware of them; and the third where little value is placed on ethics. It is often difficult to convince executives in this last group of the real value of ethics in business. Award-winning scientist and environmentalist Dr David Suzuki challenges organisations to put the protection of air, water and soil firmly on the business agenda. 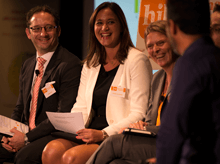 New initiatives focusing on creating a community of values-based leaders who can collaborate and support each other in changing the face of workplaces to put the wellbeing of people front and centre.